From 13 stations in 1935 to 182 in 2011, Metro also attracts thousands as an underground museum; plans to add another 120 km track by 2020. Although the Moscow Metro is the quickest and cheapest way to get around the city, convenience is far from the only reason to make a visit. The metro is a unique underground museum of 20th century Russian history—and it has an entrance fee of less than a dollar. The stations of the Moscow metro range in depth from 16 feet to 262 feet, and in design from no-frills to decadent, from elaborate to functional. Underground, more than 80 years of history unfoldes, carved out of marble and granite and built in iron and glass – laying bare the tastes, ideas, dreams, hopes, and disappointments of the previous generations. 7 mn people travel by metro every day, the highest figure in the world. The most loaded stations serve 100-150,000 passengers daily. Engineers Pyotr Balinsky and Evgeny Knorre submitted their first designs for an underground transit system to the Moscow City Duma in 1902, but the city leaders did not take the overcrowded aboveground trams and were uninterested in the proposal to improve transportation. Over the next 30 years, at least five different proposals for a subway failed to move past the development stage, but in 1931, the Central Committee of the Communist Party of the Soviet Union decided that their capital needed a metro. On May 15, 1935, the Moscow Metropolitan finally threw open its doors and carried the first passengers on its moving staircases, escalators, and the padded seats of its new wagons. The first metro line—from Sokolniki to Dvorets Sovetov (now known as Kropotkinskaya) was 6.8 miles long and had 13 stations. Today, the Moscow Metro has more than 186 miles of track distributed among 12 lines and connecting 182 stations. The city’s development plan for up to 2020 envisions the construction of another 75 miles of track. 41,6 km/h is average Moscow metro train speed. Minimal headway of 90 seconds. 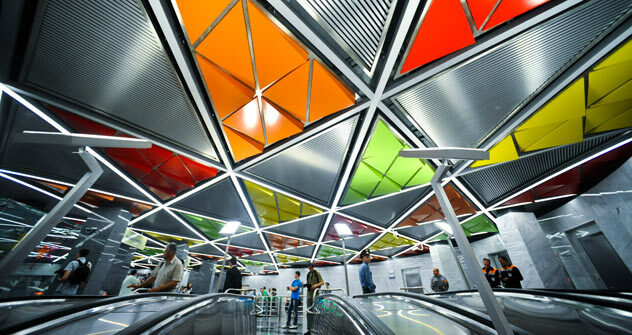 Moscow metro is the world’s leader in the volume of traffic and reliable transportation. For the first 20 years of its history, the Moscow Metro was named after Lazar Kaganovich, the “iron commissar” and Stalin’s right hand man, who was in charge of construction of the first stage of the metro system. In 1955, however, the Metro was renamed after Vladimir Lenin. Although Russia has long since changed its political track, you can still find the images of the former revolutionary at over 10 stations, including busts of Lenin at Belorusskaya and Komsomolskaya stations, impressive mosaics at Baumanskaya and Kievskaya stations, a tile panel in the passage between the Borovitskaya and Biblioteka Imeni Lenina stations. Despite his role in the metro’s construction, there are no images of Stalin on its walls. After his death in 1953 and the subsequent process of destalinization, his images were gradually withdrawn from the Moscow Metro—while sculptures were taken to storage facilities, mosaics and reliefs were simply removed. The metro stations built before the mid-1950s, were conceived and constructed as luxurious “palaces for the people;” they were great architecture for a great state. There are also allegations that there was no option but to decorate the metro with marble, stucco work and expensive aircraft steel since, in the estimation of the metro builders, the country was in no position to supply enough tiles to cover the many thousands of square miles on such a tight schedule. Art historians, however, insist that the richly-decorated underground was a deliberate ideological move, another way to eulogize the young Soviet country. Stations built between 1937 and 1955 are characteristic of the first architectural period. Everything completed at this time is worthy of special attention. For instance, the ceilings of the Mayakovskaya and Novokuznetskaya stations feature mosaic panels based on designs by artist Alexander Deineka, “24-Hour Soviet Sky” and “Heroic Labor of the Soviet People on the Home Front.”The mosaics were assembled by famous mosaic artist Vladimir Frolov, who also created mosaic icons in St. Petersburg’s Church of the Saviour on Blood. The Ploshchad Revolutsii station was decorated with 76 bronze sculptures of workers, soldiers, farmers, students and other Soviet people. There is also a frontier guard with a dog whose nose people rub for good luck. Such curious details are abundant in the history of every station. But the good times for Russian architecture ended in 1955—both underground and above ground, after the Communist Party issued a decree eliminating “extravagance in design and construction.” Stations without any stucco work, mosaics, original columns or other “unjustified” elements, were built during this time under the slogan “Kilometers at the expense of architecture.” The situation was the same above ground, where entire cities were built of identical five-storey apartment blocks, nicknamed “Khrushchevkas” after then-leader, Nikita Khrushchev. Tverskaya, Kitay-Gorod and Kolomenskaya are representative of this era. International Awards: Sokolniki (Grand Prix, Paris World Exposition 1937), above-ground vestibule of the Krasnye Vorota station (Grand Prix, Paris World Exposition 1937), Mayakovskaya (Grand Prix, 1939 New York Wold’s Fair), Kropotkinskaya (Grand Prix, 1958 Brussels World’s Fair), Komsomolskaya Koltsevaya (Grand Prix, 1958 Brussels World’s Fair). In 2004, Russia's first monorail began operating in the northern part of Moscow, linking the All-Russian Exhibition Center and the Timiryazevskaya metro station. With any luck, you can ride in a retro train, a moving art gallery or a library. The trains are actually a part of the general traffic (i.e., they do not run to any special schedule) and are used on certain lines. The Reading Moscow Train, an ordinary train on the face of it, features extracts from literary works for adults and children. Each wagon has its own selection, from children’s fairy tales to Gogol. Circle Line. The Poetry in Metro Train carries an exposition, updated this year, dedicated to Italian poets Dante Alighieri, Francesco Petrarch, Giacomo Leopardi, etc. All the poems are featured in two languages, Russian and Italian. Filevskaya Line. The Sokolniki Retro Train looks exactly like the first Moscow Metro train, both inside and out. Painted brown, it has padded seats, typical wall decorations and retro lamps. Sokolnicheskaya Line. The Aquarelle Train looks like a cabinet painted with flowers and fruit on the outside. Inside, it is an art gallery featuring art reproductions from the Vyatka Apollinary and Viktor Vasnetsov Art Museum. Arbatsko-Pokrovskaya Line. Revolution Square station (built in 1938) is close to the Red Square area. There are 72 sculptures in the station, depicting the people of the Soviet Union, including soldiers, farmers, athletes, writers, industrial workers and school children.